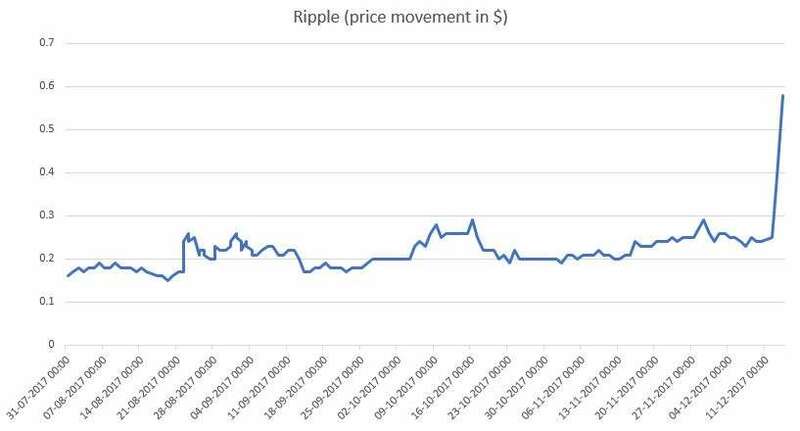 NEW DELHI: After remaining in a range of $0.15-$0.25 for the past six months, another cryptocurrency ripple spiked over 141 per cent in the past three trading sessions till December 13. The digital currency surged to $0.58 on December 14 from $0.24, according to the data available with coindesk.com. Cryptocurrency litecoin has also soared over 100% during the same period. With the sudden spike in the prices of ripple, it recently overtook litecoin in terms of market capitalisation. Ripple is fourth biggest cryptocurrency after bitcoin, ethereum and bitcoin cash. Ripple has a maket capitalisation of around $22 billion, whereas bitcoin, ethereum and bitcoin cash have a market cap of $279 billion, $72 billion and $30 billion, respectively. Bitcoin, ethereum and litecoin have soared over 68 per cent, 71 per cent and 205 per cent, respectivley, in December 2017 so far. Ripple was founded by Jed McCaleb in 2012. According to a report by Deutsche Bank Wealth Management, the principle of ripple is the verification of debentures. The account balances and also creditor-debtor relations are accessible for every user within the network. But, different from bitcoin, the generation of ripple coins is not possible through mining. The currency is only issued by ripple Labs itself. To avoid inflation the amount of ripple units is limited to 100 billion, with 99 billion already generated and around 55 billion distributed to the users. “Seen from this angle, Ripple Labs is only a digital bank. Power and control lies here with the company, not the users,” said Deutsche Bank Wealth Management in a report.